Given a legitimate need to protect Earth from the most intense forms of space weather — great bursts of electromagnetic energy and particles that can sometimes stream from the sun — some people worry that a gigantic “killer solar flare” could hurl enough energy to destroy Earth. Citing the accurate fact that solar activity is currently ramping up in its standard 11-year cycle, there are those who believe that 2012 could be coincident with such a flare. But this same solar cycle has occurred over millennia. Anyone over the age of 11 has already lived through such a solar maximum with no harm. In addition, the next solar maximum is predicted to occur in late 2013 or early 2014, not 2012. Most importantly, however, there simply isn’t enough energy in the sun to send a killer fireball 93 million miles to destroy Earth. This is not to say that space weather can’t affect our planet. The explosive heat of a solar flare can’t make it all the way to our globe, but electromagnetic radiation and energetic particles certainly can. Solar flares can temporarily alter the upper atmosphere creating disruptions with signal transmission from, say, a GPS satellite to Earth causing it to be off by many yards. Another phenomenon produced by the sun could be even more disruptive. Known as a coronal mass ejection (CME), these solar explosions propel bursts of particles and electromagnetic fluctuations into Earth’s atmosphere. Those fluctuations could induce electric fluctuations at ground level that could blow out transformers in power grids. The CME’s particles can also collide with crucial electronics onboard a satellite and disrupt its systems. But it is a problem the same way hurricanes are a problem. One can protect oneself with advance information and proper precautions. During a hurricane watch, a homeowner can stay put . . . or he can seal up the house, turn off the electronics and get out of the way. Similarly, scientists at NASA and NOAA give warnings to electric companies, spacecraft operators, and airline pilots before a CME comes to Earth so that these groups can take proper precautions. Improving these predictive abilities the same way weather prediction has improved over the last few decades is one of the reasons NASA studies the sun and space weather. 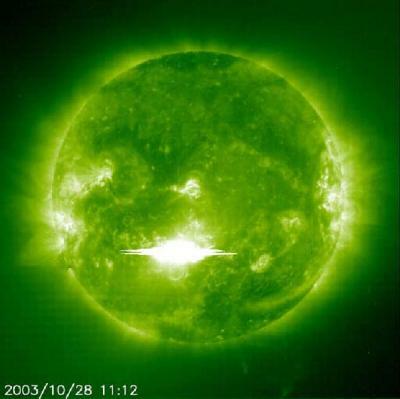 We can’t ignore space weather, but we can take appropriate measures to protect ourselves.